Login to earn PJ Points for sharing! Introducing the most luxurious addition to our brushed cotton pyjamas. This stunning fabric is predominantly made from cotton but has a small amount of wool in the weave making it extra soft and warm. 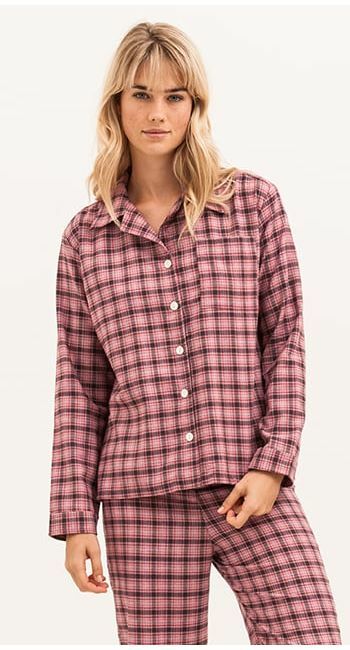 This check is also available in pink and you'll find both colourways in our dressing gown collection. Made in Britain and finished with real shell buttons. Complete the look with a pair of our toasty alpaca bed socks. Fabric type: Brushed cotton/wool blend. To earn points you must be signed into your account. Something that is very important to us is that customers love their PJ Pan nightwear and come back for more. To reward your loyalty we have a rewards scheme. nightshirts and dressing gowns however do come up slightly smaller than the pyjamas, so there is a separate size guide for them below. Extra Small (UK8) 34" 26.5" 36.5"
Small (UK10) 35.5" 28" 38"
Medium (UK12) 37" 29.5" 40"
Large (UK14/16) 39" 31.5" 42.5"
Extra Large (UK16/18) 42" 34" 44.5"
Trousers/pyjamas: true to generous fit. Regular size fits inside leg of up to 31.5". Tall size fits inside leg of up to 34" and has an extra 2.5 inches on the leg length, 1 extra inch on the sleeve length and 2 extra inches on the jacket length. NEW!! Extra tall size fits inside leg of up to 36" and has an extra 4.5" on the regular leg length, 1 extra inch on the sleeve and 2 extra inches on the jacket length. Please note that the inside leg measurements are body measurements, not garment measurements. As a very general rule of thumb, women taller than 5'8" tend to need the 'tall' size and anyone taller than 5'10" tends to need the extra tall size, but please bear in mind that we are all proportioned differently! Small (UK8/10) 34.5" 27" 37"
Medium (UK10/12) 36" 28.5" 38.5"
Large (UK12/14) 37.5" 30" 40.5"
Extra Large (UK14/16) 39" 31.5" 42.5"
Extra Extra Large (UK16/18) 42" 34" 44.5"
Nightshirts: true to small fit. Shorter length: 88cm measured down centre back from base of collar to hem. On a woman of average height this would be about mid-thigh length. Longer length: 100cm measured down centre back from base of collar to hem. On a woman of average height this would be about knee length. Please note that our nightshirts do come up slightly smaller than our pyjamas. Bed socks: please refer to the individual product pages for more information.